Located in Washington, DC's historic Shaw neighborhood is the Floridian Condominium—a modern two-building community of loft-style condos for sale. In addition to the Shaw locale, the Floridian is also considered to be in the vibrant U Street Corridor. With 118 studio, one, two and three-bedroom residences, this upscale complex offers a wide variety of floorplans. Sizes run the gamut, from 425 to 1765 square feet, with prices starting in the $300,000 range and climbing into seven figures. With dual street addresses of 919 and 929 Florida Avenue NW in the District’s 20001 zip code, this eight-story high-rise development was delivered to the public in 2008. 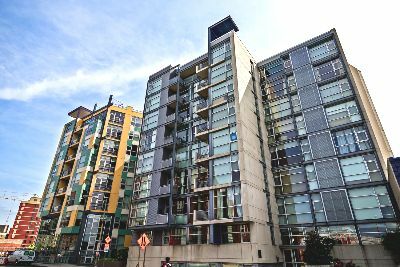 From the street, the complex presents itself with huge walls of glass, balconies, and a multi-sectional modern design. The two main wings are joined in the middle by a third component which is set back, allowing an urban courtyard entry. Condos for sale at the Floridian feature warm bamboo and maple hardwood floors, exposed 10-foot raw concrete ceilings, exposed ductwork and true floor-to-ceiling windows. Bathrooms have frameless glass showers, plus floating vanities with over-mount sinks. The bathroom tile is custom Porcelanosa. Larger master baths also come with spa tubs. As for the gourmet kitchens, there are choices of concrete, granite or quartz countertops, along with stainless steel appliances. Bedrooms at the Floridian are loft-style, with sliding barn-style doors and exposed ductwork. It is also worth noting that residences come with either Juliet or full balconies, while penthouses and other select units have additional private outdoor spaces. The building also has secure garage parking, bike storage and an impressive roof deck with great city views. Last but certainly not least is the neighborhood itself. In addition to Shaw and the U Street Corridor, the condos are also close to the Atlas District with its fantastic live music and entertainment. There are two nearby Metro stations—U Street and Shaw-Howard University. You can also add great bars and restaurants like Al Crostino, Dino’s Grotto, the Brixton, Dodge City and more.